Speaking in Geneva, the agency’s Director of Emergency Operations, Manuel Fontaine, warned that conflict is at a 30-year high: “There’s never been as much conflict in the world in the past 30 years as this year, so it is obviously a particular threat,” he said. Amid countless reports of deadly attacks on civilians and places of shelter – both of which are prohibited under international law – Mr. Fontaine insisted that the long-held notion that children should be protected above all others is also being undermined. A total of 59 countries are to benefit from UNICEF’s Humanitarian Action for Children 2019 appeal, as the agency pursues its goal of providing 41 million children with safe water, food, education, health and protection. Child protection funding amounting to $385 million includes more than $120 million for youngsters affected by the Syria crisis, whose needs are estimated at $904 million – the largest part of UNICEF’s overall appeal. 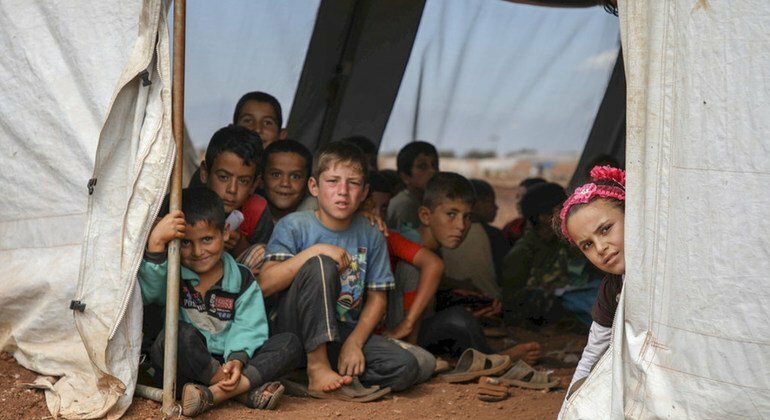 “Nearly eight years after the conflict broke out, we still have 2.5 million Syrian children living as refugees in Egypt, Iraq, Jordan, Lebanon and Turkey where demand for basic services such as health and education outstrip the capacity of institutions and infrastructure to actually respond,” Mr. Fontaine explained, noting that aid was needed for Syrian refugees and host communities. Asked if he expected a significant number of Syrian families to return to the country, the UNICEF official replied that such a development was likely premature. Needs in Yemen represent UNICEF’s second largest individual appeal, at just over $542 million, as a fragile and as-yet unimplemented ceasefire deal between Houthi militants and the internationally recognised government over the Red Sea port of Hudaydah continues to cause serious concern among humanitarians. Nearly four years since conflict escalated, more than 22 million people need humanitarian assistance, including two million Yemeni children who will require food assistance this year. “Projections from 2019 are that nearly 400,000 children will suffer from life-threatening severe acute malnutrition in Yemen during the course of the year,” Mr. Fontaine warned. Other emergency situations include the Democratic Republic of the Congo (DRC), a vast country facing a significant escalation of violence and armed conflict linked to terrible rights abuses. An ongoing outbreak of deadly Ebola virus in the east of the country has made matters worse. According to the UNICEF appeal, an estimated 1.4 million children – over three times the number at risk in Yemen – are projected to require lifesaving treatment for severe acute malnutrition in 2019. Turning to Venezuela, where 40 people have died in recent clashes between demonstrators and security forces, according to UN human rights office, (OHCHR), Mr. Fontaine appealed for children to be protected. The UNICEF official confirmed that an estimated three million people have left the troubled South American country in recent years, and that the agency is “working in the neighbouring countries, in Colombia, Brazil Ecuador and other countries to help the struggling host communities receiving families and children that are crossing the border”. Faced with such unprecedented needs, UNICEF is appealing for funding that can be allocated where it is needed most urgently, not least to under-reported emergencies including the Lake Chad region, where nearly 21 million people in Cameroon, the Central African Republic, Chad, Niger and Nigeria have been affected by ongoing conflicts. Despite the challenges, Mr. Fontaine insisted that the agency has been successful in helping vulnerable children, not least those whose mental scars caused by the “toxic stress” of conflict often take longer than physical wounds to heal.